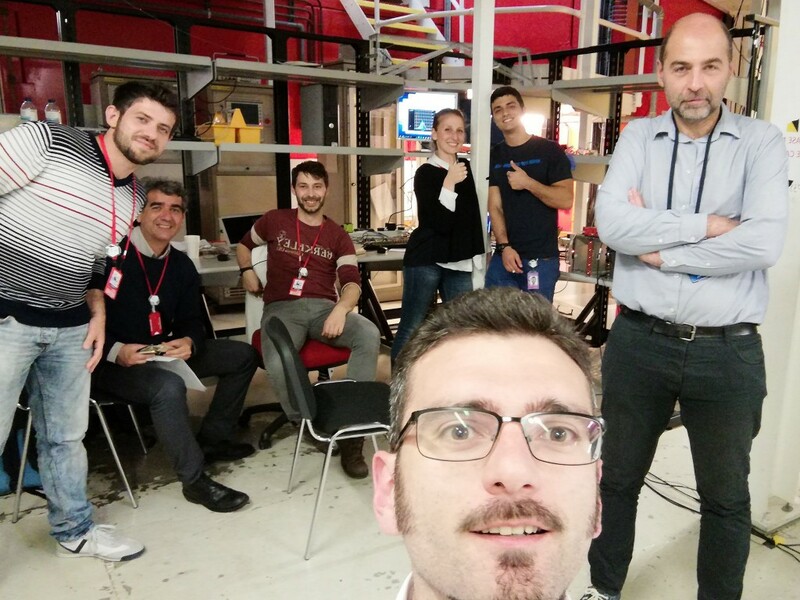 A team of two Master students and two PhD students worked on VESUVIO beamline improvement during an international experiment at the ISIS-STFC pulsed neutron and muon source. The hands-on training of the undergraduate students from the Physics department of the University of Rome Tor Vergata, Federico Chiarelli and Antonio D’Auria, was part of the course of “Modern Applied Physics” coordinated by Prof. Roberto Senesi. During the neutron experiment Federico and Antonio were supervised by Dr. Pierfrancesco Ulpiani and Dr. Dalila Onorati, first year PhD students of the University of Rome Tor Vergata. The whole team was composed also by Prof. Roberto Senesi and the instrument scientists Dr. Giovanni Romanelli and Dr. Matthew Krzystynyak. Aim of the experiment was to demonstrate the improvement of VESUVIO after the changes of the experimental set-up performed by the team. The very surprising preliminary results have demonstrated an increase of the counting statistics by a factor 6. It seems like an upgrade of the beamline without any expenses; in fact the Physics under the detection process was modified and not the hardware used. A very exiting experience for the students! !